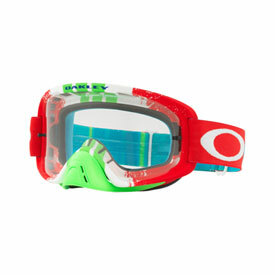 As an evolution of the legendary O-Frame goggle, the O2™ family has Oakley DNA pumping through every vein. The Oakley O2™ MX extends the O2™ style and performance The large lens with streamlined frame geometry expands peripheral view in every direction. Flexible O Matter ™ frame optimized for comfort, fit and maximized peripheral view. Large Lens with streamlined frame geometry in a compact frame size for wide range of helmet capatibily. The goggles are average with a good price. Do they fog up when you're wearing prescription glasse? Not sure if they fog up or not. I don’t wear glasses. They work great with out them. BEST ANSWER: I would think they would. I bought these for my wife and she wears a O’Neal helmet. I wear them with the Oneal Riff and they fit fine. Does this come with clear lens? BEST ANSWER: Yes. These have a clear lens.